Where there is color there is hope! I wanted to thank VIEW YOUR CHOICE for their invitation to contribute to their blog. To give you a bit of background, my name is Belinda and I am working on a project to give free workshops to teachers and schools on recyclable art. I wanted to share a story that happened while I was on a previous trip to Nepal. We were walking on the banks of the lake in Pokhara coming from a hike to one of the smaller villages. During this trip to Kathmandu I was faced with many challenges and had no idea of how to move forward with putting the dream I had into place. Especially as at that point I had only knew a handful of people in Nepal and had pretty much no funds or experience. We were chatting about what would be the next steps when I noticed a young man with gloves and a big refuse bag on the edge of the lake. There were two young Nepali boys in a crouched position sitting next to him and chatting. They asked lots of questions and looked very curious about what exactly he was doing. As we walked closer I could hear him say to them that Pokhara was such a beautiful place. After asking him what he was doing he said to them that he was picking up the rubbish and cleaning up the area. They told him it is such a big task, shaking their heads in disbelieve and he said, “All it takes is doing it one day at a time.” He smiled and continued chatting with them and cleaning up as he walked along. This man will never know the impact he had on the strangers walking by him, but it is one of those moments I will never forget. Here is a man single handedly picking up trash. He knew how enormous this task looked to others, but he was willing to do it one day at a time. He did not look at this project and say, I wish I could clean it up. But it is too much for me and what can one person do to change it.”I have the deepest respect for his efforts and realized that I should not look at the task ahead of me as impossible. Being only one person should not scare me. I have no reason to give up if I take it one day at a time. Each one of us can make that difference. Now looking back about 1.6 years later I can still feel that fear of failure in my heart sometimes. But every day I take a deep breath and am thankful for another chance, another day. At this point I have been working on plans to bring free art workshops into the rural schools in Nepal and to give free workshops to teachers. 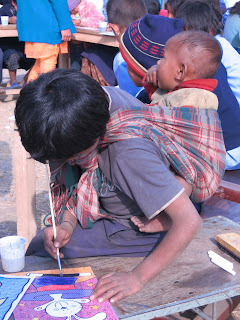 My dream is to bring creativity and color into the rural schools as I believe where there is color there is hope. I have been working on setting up workshops using recyclable materials so that the schools can continue these projects one we leave. I will be returning in December and will be there for two to three months. I would love to eventually start a small art training center where teachers can come for free workshops. Where I can set up a resource centre for them to find ideas for their classrooms and also where anybody in the area will be welcome to get ideas and read. But I will be looking to find a suitable place down south and hope to come into contact with areas that would be interested in inviting us. I truly believe that each and every child should be given the opportunity to express themselves through art and color. So many children out in the rural areas never get that opportunity. I have entered a competition to win funds that will allow me to continue this program. If you could please give me your vote as it runs for the next 2 weeks. You may vote once per day. It would make such a huge difference. Thank you again for your support.